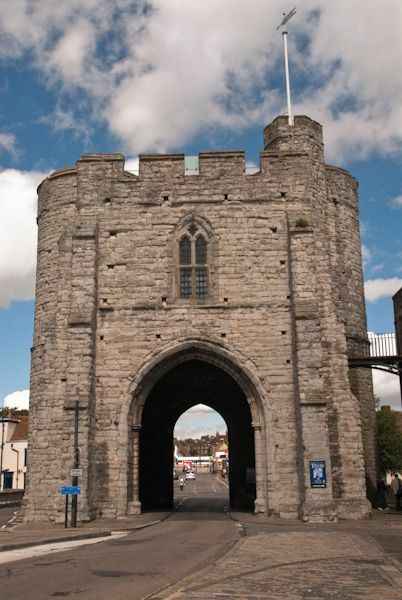 One of the iconic landmarks of Canterbury, the old West Gate stands at the west end of the High Street, beside the River Stour. Generations of medieval pilgrims passed under the gatehouse arch on their way to the shrine of Thomas Becket at Canterbury Cathedral. Road traffic now flows through the arch - it's a bit of an eye-opener to see a modern coach navigate the narrow opening! The West Gate was built by Archbishop Sudbury to replace an earlier Roman gate through the city walls. The West Gate was finished in 1380, but in the following year, Sudbury himself met a violent end at the hands of rebellious peasants during Wat Tyler's Peasant's Revolt. 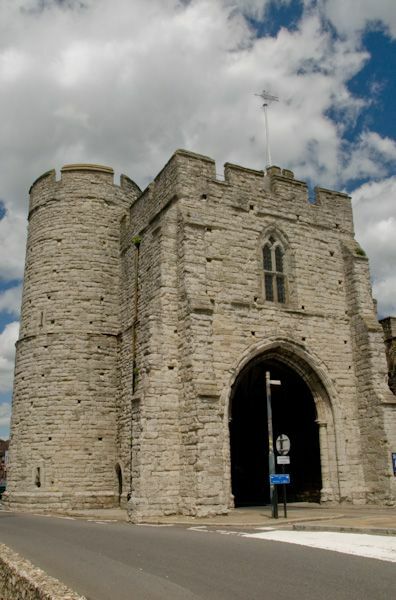 For many years the West Gate served as the town prison, connected by a walkway to the police station next door. 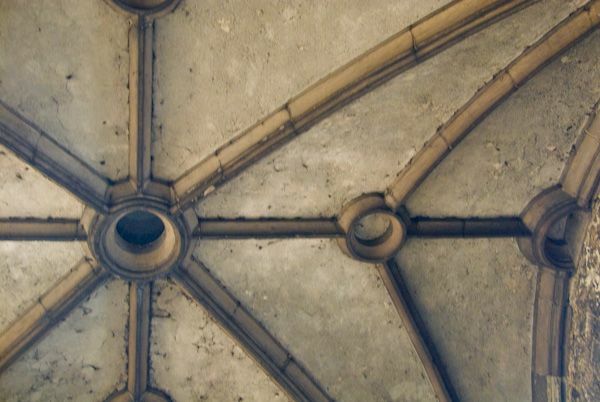 Above the portcullis slot is a 'condemned cell', where prisoners awaiting execution were held. A bronze 18th-century medallion was found beneath the floorboards of the prison floor during recent repairs. 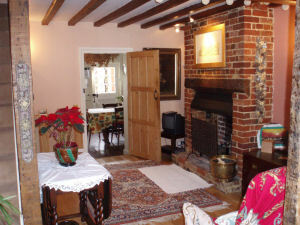 The upper floor of the gatehouse is given over to a small West Gate Museum. Here you will find armour and weapons used by defenders of Canterbury from the medieval period to World War II. 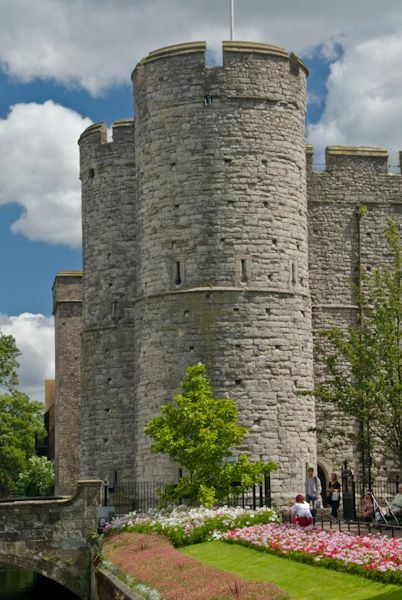 Children can dress up in replica armour, and see the old prison cells within the gatehouse tower. 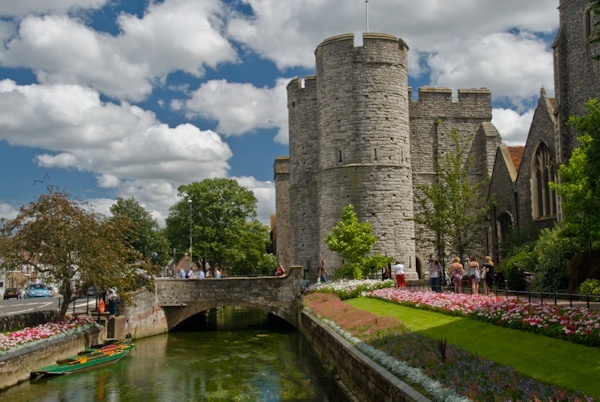 Immediately beside the tower is a lovely riverside garden, where you can take a punt tour along the River Stour. Location: At the west end of High Street. Easy foot access from the Cathedral precinct.